As a society, we have taken the term ‘immediate gratification’ to the extreme. We are accustomed to walking into any store, making a purchase and not even thinking when we are handed a plastic bag for the contents. 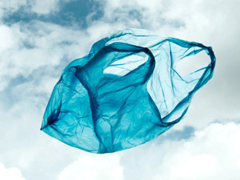 Some people may think they are easing their conscience because they are no longer using paper (and destroying trees) but the plastic bag is now becoming an environment explosion and many areas are no longer allowing plastic bags in any of the stores. In an around the 80’s, we were given choices from paper only to “paper or plastic”. Plastic bags have multiple uses, so we all slowly made the change to plastic. We can use them to line kitty litter boxes; take the trash out, gardening waste and so much more. But, the bags themselves are petroleum based products which takes a lot of energy to produce, creates greenhouse emissions in the production and do not biodegrade very fast. Many areas in the U.S. and now the world are banning the standard plastic bags. This may sound a bit excessive, but, as a people, we need to have it either ‘hit us in the wallet’ through higher cost or have an actual law to keep us from using them. Most people simply do not pay attention to the massive environmental impact they are imposing when they walk out with their vegetables from the grocery store. It is guestimated that around one trillion plastic bags are used worldwide. We are inundating our landfills, lakes and oceans with plastic bags. The convenience has turned into a monstrosity for mother earth and as an answer; there are laws that are going into effect to stop our desire for plastic bags. In Costa Mesa, California, the Earth Resource Foundation recommended that a twenty five cent tax is added to each plastic bag used by a consumer. As an alternative, the industry that is responsible for the production of all of this plastic jumped in with a proactive move to encourage more plastic bag recycling programs at the retailer level. Movements such as this are being introduced worldwide. One of the worst countries for plastic bag pollution is China. Plastic bags are everywhere, floating around in streets, lakes, run-offs and even floating in the air. The Chinese refer to it as ‘white pollution’ and a sad joke is being made that they should have the plastic bag listed as the actual flower of the nation. The answer is, of course, for us to change our habits. People are responsible and people can make a change. Some countries have made a fairly heavy decision on the plastic bag revolution. Legislation varies, but it includes either the discouragement of use or the outright banning of plastic bags. These countries include: South Africa, Mumbai (Bombay), Australia, Ireland, Bangladesh and Italy. In 2008, the city of San Francisco completely banned the use of hard to recycle plastic bags. Switching from the ease of using plastic bags to the reusable cloth bags is a complete mindset and it takes all of the household/family members to buy-into the change. First – you must get the really inexpensive, reusable cloth bags. These cannot be left sitting in the garage or the car. You have to remember to take them with you into the stores. The second is to remember that any plastic bags that you are stuck with need to be recycled. So a trip to the store will involve take the recyclable plastic in one hand and the reusable bags in the other hand. It really isn’t that hard, after you get used to it. I can’t tell you how many people comment on the fact that they have the reusable bags, but keep forgetting to bring them into the store. In this case, they have eased their conscience and bought the reusable bags, but they aren’t actually using them. This may make them feel better, but it’s not accomplishing the goal. When I go into the grocery store in Florida, I look around and see that I am the only one carrying reusable bags. Florida has a lot of older people and they have more difficulties in changing the ways that they do things. Every holiday I do a lot of baking and share with my neighbors and friends. I put each tin of baked goods in a brand new reusable bag and give it as a holiday gift with the baked goods. We shouldn’t have to be forced to stop using plastic bags, but if our society doesn’t make a change, we may find that one day we are pulled over by a traffic cop and receive a ticket for ‘the possession of a plastic bag’. Posted on March 5th under Global Ecology, Saving Our Planet.